It seems that this month is dedicated to an awareness of public art. Whether it's the beautiful weather outdoors or the sudden profusion of projects that are available outside the gallery, we're not going to complain. The residents of Toledo, Ohio might have a bit of cause for concern, however - at least until their current exhibition rolls on to another location. Hopefully, it won't change their opinions about the value of public art! You may remember a post here on Gallereo a while back about a travelling art installation/exhibit by Kurt Perschke entitled RedBall. It's more or less what the name describes - a massive, inflatable red ball that appears and disappears across the United States. We previously wrote about it being co-opted - stolen, if you will - by a corporate entity that just so happened to pretend it had never heard of Perschke's exceedingly similar project, and the ensuing legal battles. The aspect that somehow escaped mention in our earlier posting was that RedBall sometimes seems to have a mind of its own. It recently set up shop in Toledo, Ohio as part of its tour of the US at the behest of the Toledo Museum of Art, and that was the moment that residents were shown the (admittedly rare) darker side of public art installations. After a torrential downpour and heavy winds, RedBall broke free of its moorings and decided to take a little jaunt around town. 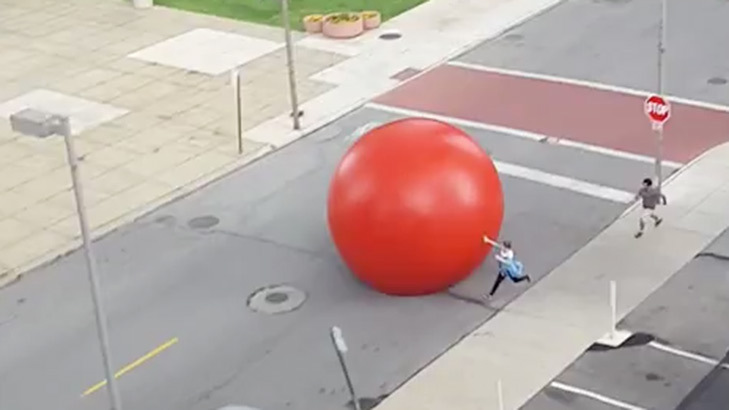 To give you a bit more of a sense of scale, the RedBall is extremely large, with a diameter of 15 feet (roughly 5 meters), and a weight of 250 pounds (roughly 110 kilograms). Fortunately, there was a bare minimum of damage to the surroundings - a bent street sign, and some incredibly amazed and disgruntled locals - although the piece itself took some damage, requiring some careful patching by diligent staff who managed to corral the RedBall back to where it belonged. Is this going to affect how you view your local neighbourhood art installations? Hopefully none of them are as potentially damaging as RedBall might have been under other circumstances, but it's always nice to add a slight - and inflatable - amount of danger to our art viewing. Something about a little bit of danger always adds a nice spice to life.